Aside from the ethics violations, these posts are riddled with misinformation. 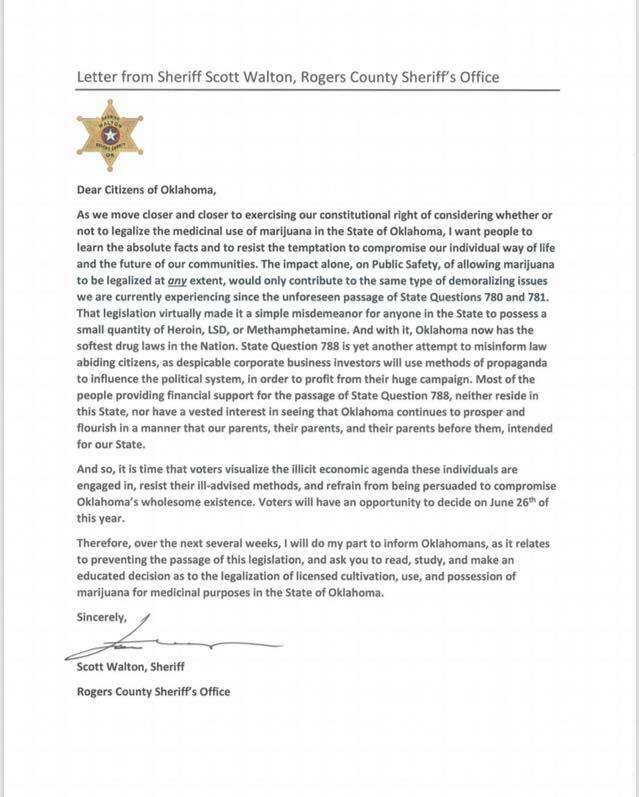 Sheriff Walton refers to the grassroots campaign of SQ788, written by the people of Oklahoma, as “huge” and that most of the people providing financial support for the passage of SQ788 do not reside in the state. 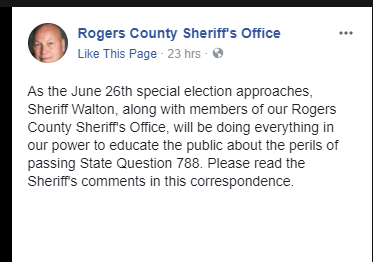 We would like to know where Sheriff Walton is getting this information as ethics reports will prove his statement false. 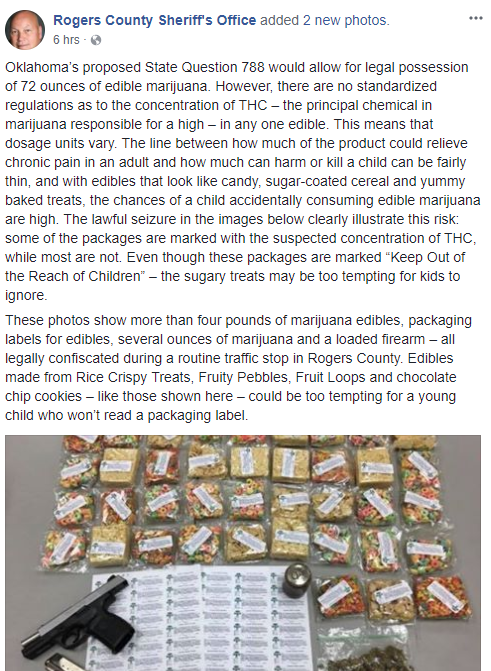 In one post where photos of confiscated edibles are displayed, it reads, “The line between how much of the product could relieve chronic pain in an adult and how much can harm or kill a child can be fairly thin…” To be clear, there have been no reported deaths from cannabis ever, even in children. When did law enforcement start playing doctor? 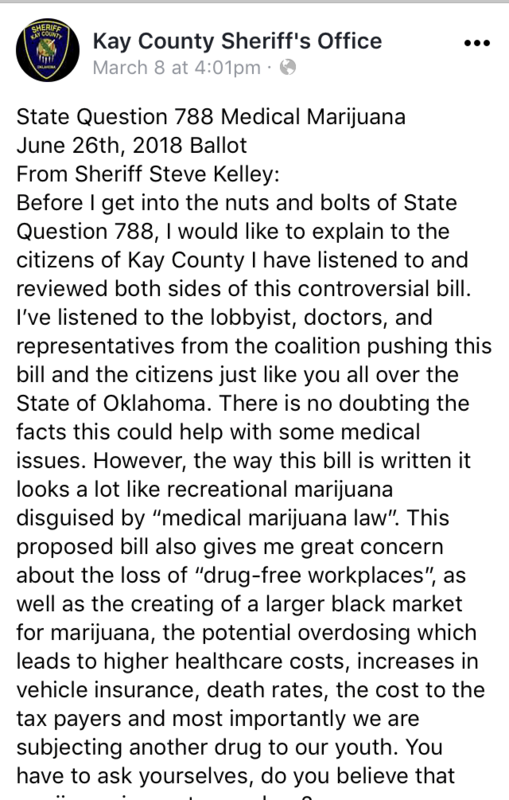 SQ788 is for medicinal purposes, to be monitored under a doctor’s recommendation and care. Walton also suggests that criminal justice reform bills, SQ780 & SQ781, created the softest drug laws in the nation. State Question 780 reclassified all drug possession, regardless of location, type of drug or number of offenses, to a misdemeanor. State Question 781 created a fund with the intention of using any savings from the passage of State Question 780 and distributing those funds to the counties for rehabilitative programs and mental health treatment for offenders. Law enforcement agencies profit from the criminalization of drug possession and it’s no surprise that they would advocate against more sensible drug policy. So far, the impact of SQ780 has been positive. State agents who advocate against bills that will reduce their revenue is a conflict of interest. Using their position and power to spread misinformation is unethical and an abuse of power. Their job is to uphold the law and laws change. § 16-119. Expenditure of Public Funds Any official in this state who shall direct or authorize the expenditure of any public funds under his care, except as specifically authorized by law, to be used either in support of, or in opposition to, any measure which is being referred to a vote of the people by means of the initiative or referendum, or which citizens of this state are attempting to have referred to a vote – 14 – Version 2017.2 of the people by the initiative or referendum, shall be deemed guilty of a misdemeanor, and the office held by such party shall be adjudged vacant and shall be filled in the manner prescribed by law. Added 1974 by SB 415 [effective January 1, 1975]. These public officials and their agencies must be held accountable for their violations. Download a Citizen’s Complaint form.